What Happens to Hazardous Materials in the Environment? 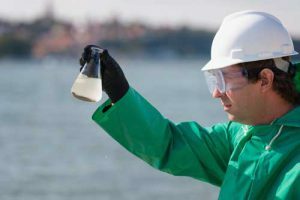 An environmental contractor takes a water sample from a lake. Would you want to drink contaminated water, breathe polluted air, or build your home on a piece of toxic land? Of course you wouldn’t. But all over the world industrial contaminants and other waste find its way into groundwater, surface water, soil, and the air. This can cause serious illness, disabilities, or even death for humans and animals. While prevention is key to our health, contaminates that currently exist require professional cleanup. This is where environmental contractors come into play. Environmental contractors are trained and skilled in preventing issues that harm the environment, and cleaning up hazardous areas, whether it’s removing asbestos insulation in a home, securing a building that’s about to be demolished, or reclamation of land after a mining project. They may also be called in to clean up after a natural disaster, consult others about preventing contamination before a project begins, or work on recycling efforts in the community. Environmental contractors need training plus licensing or permits. Many states also require them to obtain payment and/or performance surety bonds as a guarantee of their work on projects. A contractor who does not take precautions when working with hazardous materials or when working on environmental projects could contaminate the environment and cause health issues. Asbestos was commonly used as insulation in construction. The tiny fibers are a health hazard when inhaled and have been linked to over a dozen diseases, including lung cancer and mesothelioma. Improper removal can release the fibers where they can easily be inhaled. Asbestos abatement contractors remove and safely dispose of asbestos. AST’s store oil or other hazardous substances. They need to be properly maintained in order to prevent contamination and pollution. Care must be taken by contractors to ensure proper installation of aboveground storage tanks to prevent spills, leaks, or other issues that could harm the environment. This process is used to treat contaminated materials such as water and soil by stimulating the growth of microorganisms, which convert contaminants into a non-hazardous material. Asbestos abatement contractors may need to be bonded. These contractors prevent exposure to biological and chemical contaminants. Biohazard situations can include crime scenes, chemical spills, meth lab cleanup and more. Contractors who drill for wells, construction, waste management or other purposes need the knowledge and experience to properly and safely complete a project. Contractors who clean up after a fire or water incident must take care to avoid contamination. Groundwater contamination can be difficult to eliminate. Contractors may spend years or decades on a project. Hazardous waste can leach from the ground leading to pollution, birth defects, and other serious environmental issues. These sites are often referred to as Superfund sites, and in order to clean up the site, a Response Action Contractor (RAC) would be needed to do this type of work. Industrial cleaning contractors work with interior and exterior hazardous materials. Contractors must be knowledgeable about transporting and disposal of laboratory chemicals, by-products, and other products from laboratories. Contractors use physical methods to find minerals and abnormalities of an area. When a surface mining project is completed, contractors work on an environmentally-friendly reclamation plan. Landfills can easily cause great harm to the environment if not run and maintained properly. Contractors help support landfill safety throughout all its phases. Homes built before 1978 could have lead-based paint, which has been proved to cause health hazards. Contractors who remove this paint need to be certified. Contractors handling contaminated medical waste must be trained to handle the materials with care and follow strict guidelines on disposal techniques. After a mining project, a contractor must restore the land according to ecological guidelines. Contractors who remove mold must be trained in correct removal procedures. 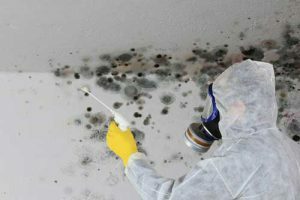 Mold can spread quickly through a home, and a contractor needs the right training to control the situation. This organic chlorine compound was largely used in coolants and insulating fluids for transformers and capacitors, plus carbonless copy paper, paint, cement, wood floor finishes, adhesives, and more. Once in the environment, it can create extreme health issues for humans and animals, including cancer. The best way to destroy PCBs is incineration at 1832°F. Applicators may need to be certified or licensed in their state. Safety measures need to be taken to avoid spills. Contractors need to know how to safely clean debris on pipelines and prevent blockage, corrosion, or other damage. Landfill owners and operators must have an environmentally-friendly plan in place for the landfill closing. Care must be taken when collecting samples for study. If not done properly, results will not be correct. Improper cleaning could result in solid waste being released into the soil. A knowledgeable contractor can prevent contamination from happening. Removing contaminated soil at petroleum sites or other locations must be done carefully. This is also known as soil washing, where contaminants are removed from the soil. 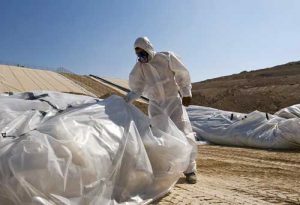 Landfill owners need to protect the soil and groundwater by the professional installation of a liner before landfill operations begin. A storage tank is considered underground if at least 10% of the tank and piping is underground. Leaks can cause contamination and failure to do an appropriate cleanup can result in heavy fines of up to $37,500 a day. 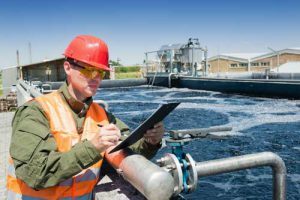 Contractors at water treatment plants may need to obtain a surety bond. Water supplies are treated and cleaned for safe public use. Proper management of water treatment plants is vital to health safety and environmental quality. Converting wastewater that can be safely used or returned to the water cycle. A maintenance program is important to prevent safety hazards that could result from contaminated water. Wetland areas have been affected by draining and altering the land to accommodate growing human population. Besides affecting freshwater sources, local wildlife also lost access to food and a safe habitat. Professional wetland rehabilitation is necessary. What Does an Environmental Surety Bond Cost? The bond amount varies for each state and bond type. The premium environmental contractors pay for a bond depends on their credit, work on hand, business and personal financials, bid or contract amount, and other factors. SuretyGroup.com is licensed to write all environmental surety bonds in all 50 states. Contact our Surety Bond Specialists to get a free quote that fits your specific situation. Thanks for this info. It really helped me!